July | 2013 | Mike Lamberti, From Margate To Cleveland, And Back ! It was a seemingly obscure rule which, on July 24, 1983, made news in what many consider one of the more controversial calls and subsequent reversals in Major League Baseball history. Now, 30 years later, the ‘Pine Tar Game’ between the New York Yankees and Kansas City Royals at Yankee Stadium is being remembered again. Recently, I had the chance to speak with the home plate umpire from that game, Tim McClelland, who was in his first season in the majors in 1983 and today is one of baseball’s most veteran umps. To set the stage, the Yankees led the Royals, 4-3, in the top of the ninth inning. There were two outs and Kansas City’s U.L. Washington was on first base. George Brett stepped to the plate against Yankees closer Rich ‘Goose’ Gossage, in a battle of future Hall of Famers, and launched a two-run homer to right field, giving Kansas City a 5-4 lead. 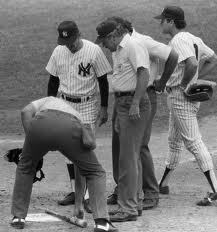 As Brett rounded the bases, Yankees manager Billy Martin approached McClellland. The umpires consisted of crew chief Joe Brinkman, as well as Drew Coble and Nick Bremigan. Back then, the rule stated that if the bat was illegal, the batter in question would be called out. Since the Royals were down to its final out, the game, in essence would be over and the Yankees would win. Now, bear in mind that Martin supposedly knew all along that day that Brett’s bat had too much pine tar on it, but obviously was waiting for the right situation to bring it to the umpires’ attention. Had Brett popped up to end that game, would the call have been made? Tim McClelland measures the pine tar on George Brett’s bat as Yankees manager Billy Martin watches, along with fellow umpires. McClelland remembers Bremigan as the point man when it came to any rule in baseball. Brett had long returned to the dugout and sat on the bench while McClelland and his crew mates checked the bat. The umpires conferred and agreed that Martin was right. Brett, in a scene which will forever be linked to baseball lore, tore out of the dugout and ran toward McClelland. 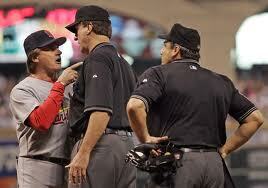 He was held back by other umpires, as well as Howser, who had also gone out to argue at that point. 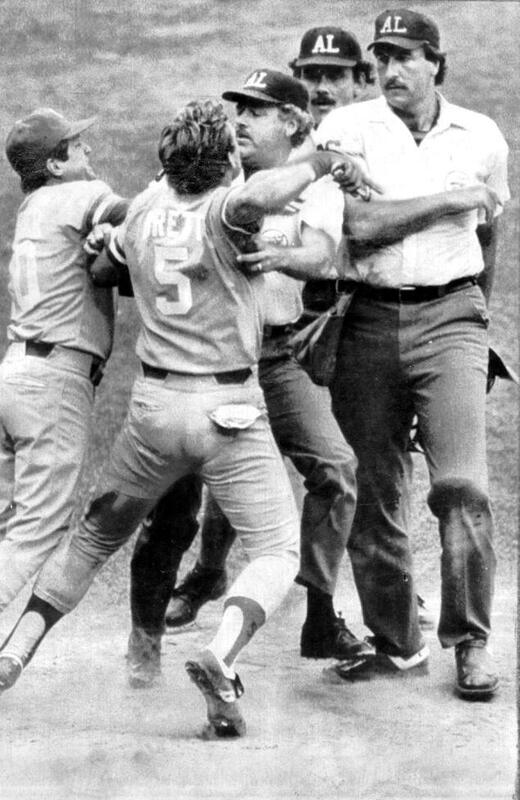 George Brett is restrained by umpires away from Tim McClelland (far right) after the Pine Tar call. The Yankees were considered the winners, but the Royals would eventually protest and American League president Lee MacPhail overruled McClelland’s decision and ordered the game be completed on an agreed-upon date. McClelland had no idea the call would create so much controversy. Ironically, five days later, on July 29, 1983, McClelland was on the plate for a game in Detroit that featured Kansas City. Tim McClelland, here speaking with Cardinals manager Tony LaRussa during the 2005 National League championship series as umpire Phil Cuzzi watches, has seen his share of controversies as a Major League umpire. He’s now in his 31st season and 14th year as a crew chief. In another bit of irony, McClelland was the first base umpire on Sept. 30, 1992 when Brett collected his 3,000th career hit, a single, at Anaheim Stadium. McClelland was among the first people to congratulate Brett after his historic hit. MacPhail’s overrule of McClelland’s call meant the game with the Yankees wasn’t over. On Aug. 18, 1983, it was concluded when the teams met at Yankee Stadium to finish the game, which Kansas City eventually won, 5-4. At the end of the ’83 season, the pine tar rule was amended to say the bat would be tossed out of the game, or needed to be cleaned up, but a player would not be automatically called out. Thirty years have passed since the Pine Tar game. Both Martin and Howser have passed away, as have MacPhail, Bremigan and the Royals’ closer, Dan Quisenberry, who retired the Yankees in the bottom of the ninth to record the save some 25 days after the game had started. Three players, Brett, Gossage and the Yankees’ Dave Winfield, would eventually be selected to the Baseball Hall of Fame. The Royals’ starting pitcher, Bud Black, is now the manager of the San Diego Padres while current Dodgers manager Don Mattingly was in his first extended season with the Yankees and would begin an era of offensive dominance the following season. Hal McRae was the next batter for Kansas City after Brett’s homer. When the teams concluded the game on Aug. 18, the umpiring crew was different. The game took about 15 minutes to finish and was played before about 1,200 fans at Yankee Stadium. Those that had tickets to the July 24 game were granted free access while others paid $2.50 to get in. There were numerous court appeals filed by the Yankees and the conclusion of the game itself wasn’t finalized until after the Royals landed at Newark Airport on Aug. 18. Yankees pitcher Ron Guidry played centerfield and Mattingly moved from first to second for the final Kansas City out in the top of the ninth, making Mattingly one of the rare left-handers to play second base in a Major League game. (Those moves were made by Martin, who was still fuming over McClelland’s call being overturned, as a form of protest). When the game resumed, the Yankees appealed that Brett didn’t touch first base after hitting the homer and pitcher George Frazier threw to first base before McRae batted, but Welke, the first base ump, ruled Brett had touched the base. An affadavit, signed by the original four umpires was also produced by second base umpire Dave Phillips, verifying that Brett and Washington did touch all the bases after the two-run homer. Brett was not at the conclusion of the game. He went directly to Baltimore, the Royals’ next stop on their current road trip, after the team arrived at Newark Airport. Brett had actually been ejected from the game for his outburst at McClelland, as was Howser, for arguing the call on July 24. Does McClelland have any animosity toward MacPhail’s decision 30 years later? “No, not at all,” McClellland said. “We made the call based on the rules at the time. It was as simple as that.